I personally use this generator and it works flawlessly every time. of buying it already prepared. 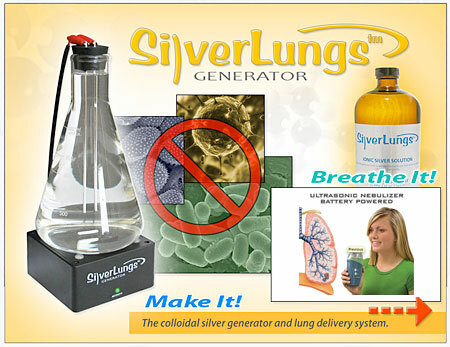 The SilverLungs Generator is a reliable and highly cost-effective home-based generator the produces extremely small particles of (0.9999) pure elemental silver as well as trillions of silver ions. Those who are familiar with the countless benefits of silver know that buying and consuming silver solutions regularly can be quite costly. As well, having the ability to create endless silver solution on-site cann be vital in times of need. Making perfect colloidal silver requires pure distilled water. This is one that I use and it makes perfect 0.00 PPM distilled water. (Be sure NOT to use the carbon filter packs that are included) And be sure to get the TDS Water Test Meter from SilverLungs. Is Silver Under the Gun Because It IS the "Magic Bullet?" PROTECT YOUR RIGHTS TO MAKE YOUR OWN HEALTH CHOICES! Make your tax deductible donation now to keep health freedom strong. Click here. The article following this essay looks at an emerging danger, the newly virulent Cryptococcus gatti fungus. Apparently weaponized, this may be "The Next Big Thing" for the genocidalists at WHO and elsewhere. If so, we need to have a defensive strategy and an offensive one as well. I believe that the defensive one is to have as much high quality Nano Silver on hand as you estimate you will need both for immediate use and for what comes next, and next, and next again after that. Because it appears that the plagues manufactured in laboratories will keep coming. Nano Silver will keep you safe if you have it and if you use it. The offensive strategy is two fold: protect our health options and expose the genocidal agenda at every turn, making it so widely understood that the secrecy which allows it to function is shattered. Make the myth of overpopulation a thing of the past, like the myth of necessary female circumcision or a flat earth. Let's think this through. What happens if we protect Nano Silver? What happens if its use in animals and humans is so widespread that it eliminates antibiotics altogether? Physicists use "thought experiments" to guide them to new approaches when the experiment is too hard, too expensive or too novel to actually conduct. By working through the experiment in their minds, they can make [very] educated guesses about what happens next if they were to conduct the experiment in the real world. Antibiotics are widely understood to be overused, leading to drug resistant and multiply drug resistant pathogens. Vaccines have never been tested in a placebo controlled, double blind study to show that they are effective in either preventing or treating any disease. Vaccine manufacturers and regulators hold the position that it would be "unethical" to deprive the test subjects of the benefits of vaccines even though such benefits have never been rigorously documented while vaccine dangers have been. 90% of all antibiotics used world wide are used in factory farming. Is non-toxic to the environment and to living organisms since it leaves coalesces into larger ionic units which have no biological impact once it leaves the body. Leaves the body rather than accumulating in it due to its ultra-small size making overdose impossible. Cannot lead to the generation of new super bugs even with wide spread use since its mechanism of action does not permit organisms to develop resistance. 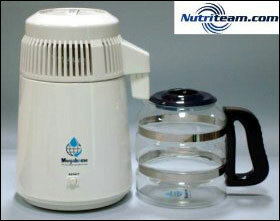 Is inexpensive and has an indefinite shelf life, requires no refrigeration or other special care. Is self sterilizing, automatically killing disease causing organisms if it is contaminated by them. Is safe and effective for use in people of every age and condition and animals of all types. Does not kill beneficial bacteria leaving both gut and skin pro-biotic organisms intact while killing pathogens. Boosts white blood cell function, providing enhanced immune response. If Nano Silver were widely available, what would the results be? No new drug resistant organisms would emerge through the use of Nano Silver since its mechanism of action makes the acquisition of resistance impossible except through horizontal gene transfer. Any such organisms would be killed if they caused disease in humans or animals since they would be treated by Nano Silver. Finely divided silver (without biological effect) would increase in effluent water and soil. This poses no known health or environmental danger. In 2004, 13% of all patients who acquired nosicomial infections died. Any pandemic, plague, or epidemic, whether intentional or unintentional, would be successfully halted by the universal application of Nano Silver orally. Globalist plans for depopulation would be adversely impacted since communicable disease, including weaponized viruses, bacteria, etc., would be ineffective against a population supplied with Nano Silver. Vaccine deniers would increase in number since epidemic diseases would be a thing of the past. Globalists and their supporters would have to resort to means other than infectious agents, deadly drugs and dangerous, immune compromising vaccines to reduce the population. The 10-15% of the population which Bill Gates stated in a recent TED lecture could be eliminated through properly used vaccines would not die. The myth of over population would suffer serious damage as the world population did not devour the available resources and the false mathematical and social engineering premises upon which it is based would be visibly flawed. See "Overpopulation, the Making of A Myth", http://simranjeet.com/). Local, clean and unadulterated food production could be instituted around the globe to enhance the health of people no longer dying from communicable diseases and parasites. Chronic and deadly diseases like malaria, dengue fever, elephantiasis, tuberculosis, HIV and a host of others will become easily curable diseases. Economic productivity and prosperity of poor and ill countries will rise as personal productivity increases due to decreased health care giver requirements and decreased time away from job and school. Decreased overall health costs locally, nationally and internationally reversing some of the crushing burden of modern health costs through decreased hospital stays, increased infectious disease self care (fewer doctor and hospital visits and services), decreased drug and drug complication costs, less time away from job and school). Increased Happiness Index, which is directly related to subjective (and, to a lesser degree, objective) measures of health. Antibiotic and vaccine manufacturers will counter the loss of their market by political, propaganda and economic thrusts designed to eliminate Nano Silver. These will include - Criminalizing and banning Nano Silver (already accomplished as of January 1, 2010 in the European Union and underway in the US) - Deceptive science to "show" that the product is dangerous or ineffective - Media campaigns to deride and/or demonize Nano Silver. I think that covers most of the major impact of making Nano Silver widely and easily available. You have the good (health, autonomy, cost), the bad (pension and stock market impact) and the ugly (intentional, weaponized pandemics would be totally ineffective if they were based, as they have been to date, on infectious disease agents). The net result? Stock up on Nano Silver, which we believe to have an indefinite shelf life. But whatever Nano Silver you choose to purchase, make sure that you have a good supply on hand. The apparently bioengineered Cryptococcus gatti fungi may be upon us as the next plague. MRSA may be the next plague. The next plague may be one that we have not heard of yet, but which has been in the works for years. Who know? Well, actually, it is very likely that WHO does know. But Nano Silver simply eliminates the threat of an infectious danger, IF you have it on hand and take it when the time is ripe. I do. I hope that you do, too. Back in 2008, the U.S. Department of Defense (DOD) in conjunction with several other federal agencies quietly conducted clinical research into the use of silver nanoparticles against Ebola and other hemorrhagic fever viruses. And what they found was astonishing. They discovered that silver nanoparticles were highly effective against these deadly viruses, including the Ebola virus. They later presented their findings to federal health regulators and other national health authorities. But it was all kept top secret. The presentation was called "Silver Nanoparticles Neutralize Hemorrhagic Fever Viruses." And the gist of the presentation was that silver nanoparticles displayed "powerful neutralizing effects against hemorrhagic fever viruses," including Arenavirus and Filovirus (i.e., Ebola). This clinical presentation was conducted under the auspices of the DOD's Defense Threat Reduction Agency (DTRA) and the U.S. Strategic Command (USSTRATCOM) Center for Combating Weapons of Mass Destruction. And the presentation was given by researchers from the Applied Biotechnology Branch, 711th Human Performance Wing of the Air Force Research Laboratory. In other words, those are the big guns, folks! Which is to say, those are the very people responsible for keeping this nation safe from outside threats like bioterrorism. That clinical presentation, made to federal regulators and national health authorities, was later summarized in a printed document, de-classified, and cleared for public release. But there was no news media hoopla surrounding the release of this information. Not a peep. And to this very day, to my knowledge, there still hasn't been a single report in the mainstream news media on the release of this important information, in spite of the fact that Department of Defense researchers found antimicrobial silver to be profoundly effective against Ebola and other hemorrhagic fever viruses, under certain circumstances. Before we get into the results of this research, as documented in the published version of the DOD presentation, it's important to note that one of the main tasks of the DOD's Defense Threat Reduction Agency is to "anticipate and mitigate future threats long before they have a chance to harm the United States and our allies." In other words, the researchers were specifically looking for ways to stop Ebola or other hemorrhagic fever viruses from damaging our national security. And the results they found when using silver nanoparticles for that precise purpose were strikingly positive -- enough so to warrant not just the presentation to health and regulatory authorities, but its later publication and public release. The researchers tested silver nanoparticles of several different sizes and concentrations on infected cells in vitro (meaning, in the test tube). And they concluded that silver nanoparticles were able to neutralize hemorrhagic fever viruses inside the cells by "decreasing S segment gene expression and concomitantly decreasing progeny virus production." Translation: Silver stops the Ebola virus and related hemorrhagic fever viruses from replicating inside the cells. And when there's no viral replication inside the cells, there's no spread of infection! The researchers had discovered the holy grail Ebola treatments. But they also discovered that neutralization of the virus by silver occurs during the early phases of viral replication. Therefore, they pointed out that for antimicrobial silver to be effective against Ebola and other hemorrhagic fever viruses, the treatment would have to be administered PRIOR to viral infection or at least within the first few hours after initial exposure to the virus. Another interesting thing the researchers discovered is that while an enzymatic protein called Cathepsin B has been shown to play an essential role in Ebola virus replication, silver nanoparticles work to decrease cathepsin activity, thus further limiting viral replication in the cell and subsequent spread of the virus to other cells. And by far the most interesting thing the researchers discovered (at least, to me) is that only very low concentrations of silver nanoparticles were necessary to prevent replication of the virus. This means that low concentrations of 10 ppm nanosilver appears to have worked better than higher concentrations of 25 ppm or 50 ppm nanosilver. This means there's no need for overly high silver concentrations. Do not let CS makers and resellers try to tell you that because it is a higher pPM that it is better... this is nonsense and simply the opposite from truth. (Read more on this here) What's more, the smallest silver particles tested by the researchers worked far better than the larger silver particles tested. This demonstrates once more that the use of very small silver particles is far more important than the "ppm" or concentration of the colloidal silver solution one is using. Simply put, smaller silver particles penetrate cells and tissues easier, and are therefore better able to get to the point of infection before the virus spreads. Here's a link to the printed version of the DOD clinical presentation, so you can scroll through it and read it for yourself. It's technical. But if you take your time it's relatively understandable.